Sasha Ardabiev is a Moscow-based blogger whose Instagram account is dedicated to fashion looks under 3000 roubles (about $50) sourced exclusively from a French bargain supermarket chain Auchan. Ardabiev on his account @cheap_sasha creates fashion photo shoots mixing menswear and womenswear: from a minimalist Steve Jobs turtleneck to a trendy bucket hat and waist bag Gosha Rubchinsky look, the blogger’s aim is to fight fashion snobbery and show that cheap clothes can look good with proper styling. Previously he featured looks from other affordable stores but stopped because he was not allowed to leave the changing rooms area while he says in Auchan he has the freedom to walk around the store dressed up and collect items to use as props. 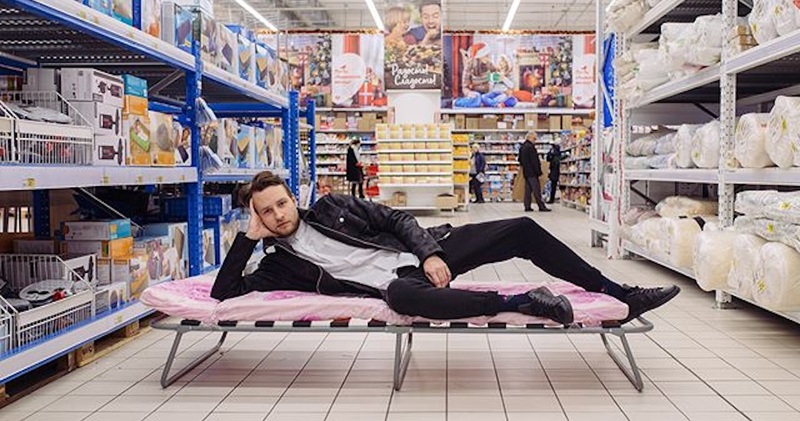 Auchan is a supermarket chain that has been on the Russian market for over 15 years and now owns 200 stores all over the country and has become a meme for being popular and cheap - pop stars sing songs about it and rap stars film their videos in the store’s parking lots. All Ardabiev’s posts are also captioned in English with prices for individual items.